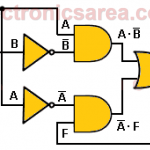 The main difference between combinational circuits and sequential circuits is that in sequential circuits there is one or more output signals fed back to one or more inputs to obtain a new output. The Truth Table is used to simplify boolean equations obtained from digital circuits. The truth tables can have many columns, but all tables operate in the same way. 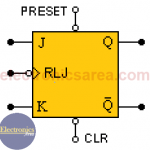 The JK Flip-Flop is a sequential device with 3 inputs (J, K, CLK (clock signal)) and 2 outputs (Q and Q’). J and K are control inputs. Binary to Gray Code Conversion and Gray code to Binary Conversion. 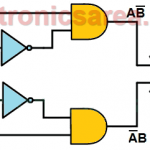 NAND Gate – Truth table. 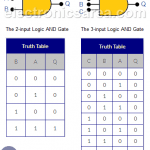 Truth tables for the NAND gate. The Gray code is a special type of binary code that is unweighted (the digits that make up the code does not have an assigned weight). Its characteristic is that between a combination of digits and the next, whether upstream or downstream, there is only a difference of one digit. Aiken BCD code is similar to the natural BCD code, but with “weights” or “values” distributed differently. The Excess 3 Code is obtained by adding “3” to each combination of the natural BCD code.